As the Montreal Canadiens celebrate their centennial anniversary, fans ensured their team would be well represented with the NHL's midseason classic back in town for the first time since 1993. Four Canadiens will be in the starting lineup in the 57th All-Star game on Sunday night at the Bell Centre as Montreal continues to honor its rich history as part of its season-long festivities. Though the Habs are in the middle of the pack for a playoff spot, their fans - arguably among the league's most ardent - made it clear who they wanted to see start for the Eastern Conference. Carey Price will be in goal with Andrei Markov and Mike Komisarek on defense and Alex Kovalev up front on a line with NHL scoring leader Evgeni Malkin (70 points) of Pittsburgh and Tampa Bay's Martin St. Louis, starting in place of injured Penguins star Sidney Crosby. Price received the most votes among the Montreal starters with more than 1.5 million. After missing three weeks with a sprained ankle before returning on Tuesday, the first-time All-Star said he didn't want to miss a chance to play on this stage. "This is one thing I really wanted to do the whole year," said Price, 16-5-5 with a 2.35 goals-against average. "When I got hurt and I thought about missing this game, I was pretty heartbroken. But I was fortunate enough to have the right timing. This event has always been one of my favorite events growing up as a kid, and just having the honor to be on the ice will all these talented players is awesome." A two-time All-Star, Markov leads Montreal with 30 assists and 37 points, but the debuting Komisarek has been limited by a shoulder injury to only 30 games. Kovalev, who will make his third All-Star appearance and captain the East, is third on the Canadiens with 33 points. With the starting lineup dominated by the Canadiens, that's forced some big names into reserve roles. None may be bigger than Alex Ovechkin. Earlier this month, Washington coach Bruce Boudreau called the reigning MVP's omission from the starting lineup "dumb," and perhaps for good reason. Ovechkin shook off a month-long slump to start the season and now leads the league with 31 goals. Also among those added to the East squad are Philadelphia's Jeff Carter, New Jersey's Zach Parise and Buffalo's Thomas Vanek. Carter is second in the NHL with 30 goals, and Parise and Vanek are tied for third with 28. Backing up Price will be three-time Vezina Trophy finalist Henrik Lundqvist of the New York Rangers, and Tim Thomas, who's 20-5-4 with a 2.09 GAA to help lead Boston (34-8-5) to the best record in the East. "When you can go (to the All-Star game) and you're the team that everyone is looking up to this year, that everybody is chasing, it definitely gives you a little bit of inner confidence," Thomas said ahead of his second straight All-Star game. For the West's starting lineup, fans selected three players from one of the league's surprise teams, and the remaining three from another club that's struggling but still considered dangerous. Patrick Kane, Jonathan Toews and Brian Campbell of Chicago will join Anaheim's Ryan Getzlaf, Scott Niedermayer and Jean-Sebastien Giguere. Making their All-Star debuts, Kane (42 points) and Toews (36) rank first and third in scoring, respectively, for the Blackhawks, who are enjoying a resurgence as they seek their first playoff berth since 2002. Campbell, a three-time All-Star, is one of the league's better offensive defensemen. Like Price, Kane also is working his way back from injury. Last season's Calder Trophy winner injured his ankle on Dec. 30, and has one assist in nine games since. "You rarely get opportunities like this to be at an All-Star game, so you are not going to take time off," Kane told the NHL's official Web site. Getzlaf, who will center for Kane and Toews, leads the Ducks with 56 points as he plays in his second straight All-Star game. Niedermayer, a four-time Stanley Cup winner, will skate in his sixth. 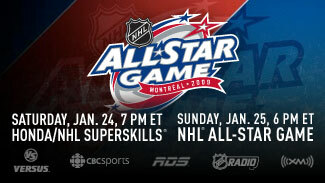 Giguere - a Montreal native - will make his first All-Star appearance despite a subpar season by his standards. After winning at least 30 games each of the last three seasons, he's 12-12-4 with a 3.08 GAA, his highest since playing with Calgary a decade ago. Even with three starters, the Ducks are in a three-way tie for sixth place in the tightly-packed West, which will have three players from conference-leading San Jose (34-6-5) on the roster. Former MVP Joe Thornton (43 assists, 55 points) will captain the West, and high-scoring defenseman Dan Boyle (13 goals, 25 assists) will be joined by Patrick Marleau. The Sharks captain has a team-best 25 goals, and his 51 points has already surpassed last season's total. Backing up Giguere will be Minnesota's Niklas Backstrom (22-15-2, 2.22 GAA) and Montreal-born Roberto Luongo (11-6-4, 2.59 GAA, 5 shutouts) of Vancouver. The only two members from defending Stanley Cup champion Detroit will not play on Sunday, and also get some extended time off courtesy of the league. Nicklas Lidstrom and Pavel Datsyuk declined their All-Star invites, citing injuries. Since they did not appear in Montreal, they also will sit out the Red Wings' first game following the break on Tuesday against Columbus. The league's general managers decided a year ago to punish those who skip the weekend after several pulled out of last year's festivities in Atlanta. "We've all got obligations to the fans, the rights-holders. This game is being televised around the world," said NHL disciplinarian Colin Campbell.